The following is a small selection of titles from our current inventory. Other titles will be added. All prices shown are in Canadian dollars. We endeavour to identify and describe all material accurately. Please see our “Contact and Ordering” page for further details. If you have questions, wish to order, or seek other information, we prefer e-mail. ‘Wants’ lists are always welcome. Please stay tuned for more extensive lists in our “Catalogues” page and for further additions to our “Features” page. Note: Items listed on our “Features” page are not always housed in the shop. If you are making a trip to visit us in order to view a specific book, best to let us know in advance. ABBOT, Willis J. Soldiers of the Sea: The Story of the United States Marine Corps. New York: Dodd, Mead And Company, 1918. 8vo., x, 315 pp. Dark blue pictorial cloth depicting soldier with bayonet against a background of sea and ship in black and orange, printed in black on upper board and spine. Frontis. plus 15 illustrated and photo. monochrome plates. Minor rub to outer corners of boards. Very small nick to head of spine. Front hinge exposed for 1 ¼ inches and paper repaired for remainder. Binding tight. Minor fox spots to prelims. and very minor foxing on a few leaves and plates, heavier on rear endpapers. Previous owner’s signature in pencil on front free endpaper. Small chips to foredge of 3 leaves. Printer’s error on p. 107 where lower corner of text is blank and printed on lower corner of verso. All edges slightly age-toned. Still a bright, very nice copy. 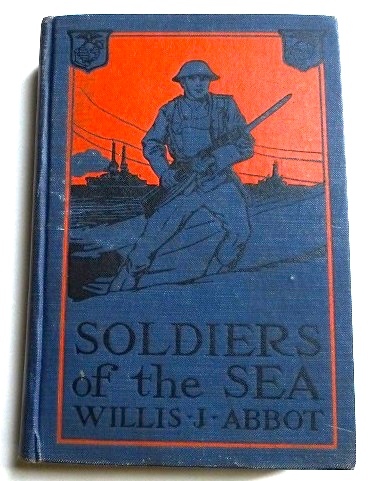 Willis John Abbot (1863-1934) was an American journalist and prolific author of military and merchant marine books. This work covers the history of the U.S. Marine Corps from their formation through various engagements to their early actions in France during the First World War. BABBAGE, Charles. On the Economy of Machinery and Manufactures. London: Charles Knight, 1835. Small 8vo., 6 ½ inches, xxiv, 408 pp. including additions and index. Title page with engraved circular medallion depicting bust of Roger Bacon. Contemporary full brown calf with triple blind-tooled fillets to boards and three of four spine compartments, the other with gilt title on deep red morocco label. Gilt-decorated bands. Board edges and inner dentelles in gilt. Marbled edges and endpapers. 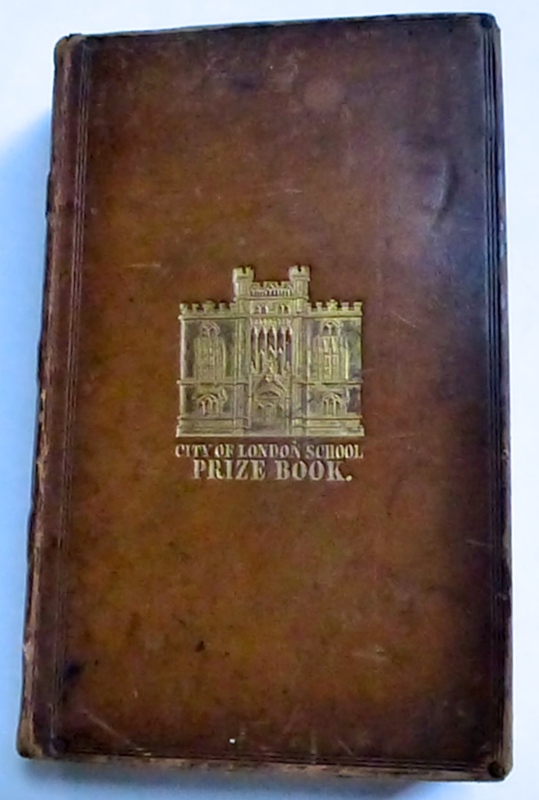 This is a prize binding, the upper board lettered in gilt: “City of London School Prize Book” with the façade of the school building stamped in gilt above. A neat prize inscription in blank ink and dated June 21, 1839, appears on the first blank. Joints and extremities of boards and spine are rubbed with mild surface scratches. Minor spots to some leaves but generally clean. An attractive copy. Charles Babbage (1792-1871) professor of mathematics in the University of Cambridge, is perhaps best remembered for this book, one of the earliest on operations research. Already known for his pioneering work on a calculating machine, this book is the outcome of his detailed survey of factory workshops, a reflection of his broader interest in scientific and industrial economy. Babbage’s forward-looking predictions, inventions and solutions, together with his mathematical background, made this book an obvious choice as a prize for a senior mathematics student at the City of London School in 1839. The independent school, opened in 1837 in a new building designed by the city of London’s architect J.B. Bunning, initially housed about 400 pupils. It was unusual for its time in that it promoted a practical and progressive scheme of education which was ahead of its time. Its broad array of subjects offered did not diminish the excellence of its teaching in traditional subjects. Throughout the nineteenth century the school sent classical and mathematics scholars on to Oxford and Cambridge. The recipient of this prize, very early in the school’s history, was probably one of them. 4th edition enlarged. Originally published in 1832. With each of the 4 prefaces included. This is recognised as the best edition of the work and is the first to contain an index. A classic treatise. BISHOP, John George. 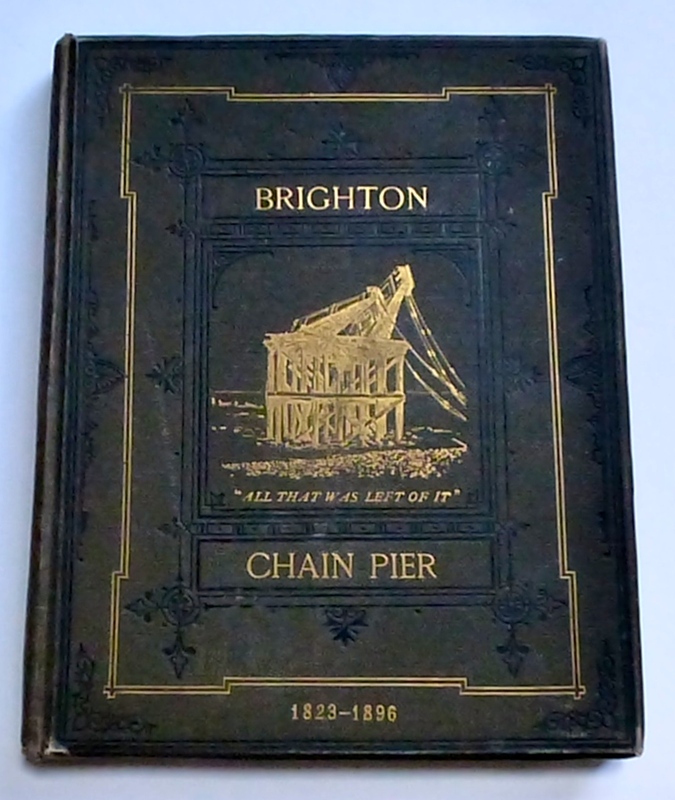 The Brighton Chain Pier: In Memoriam, Its History From 1823 to 1896, With a Biographical Notice of Sir Samuel Brown, Its Designer and Constructor, and an Appendix. Brighton: Printed and Published by J.G. Bishop, ‘Brighton Herald’ Office, 1897. 4to., (8), 74, xxv pp. plus plates including a double-page frontis. 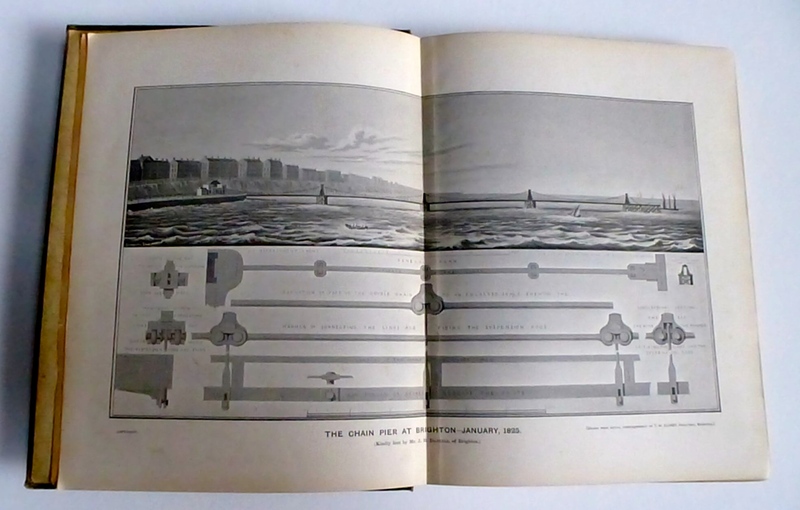 diagram of the Chain Pier, January, 1825. Publisher’s dark brown pebbled cloth, bevelled boards, upper board and spine stamped in black and gilt, lower board blind stamped. All edges gilt. Pale blue patterned endpapers. Title page printed in pink and black. Monochrome plates throughout including illustrations and photographs. Moderate rub and wear to extremities, particularly head and tail of spine and corners. Minor damage to back hinge with small hole and tears at endpapers. Light foxing to blank fly-leaves. Otherwise a tight, clean, bright copy. The famous landmark was almost completely destroyed by a storm in late 1896. This enduring memorial was compiled by Bishop, a local author and editor of the ‘Brighton Herald’, at the request of friends. The cloth edition was preceded by a shorter paper-covered stitched booklet. CRICHTON, Andrew. History of Arabia and its People: Containing An Account of the Country and its Inhabitants, The Life and Religion of Mohammed, The Conquest, Arts, And Literature of the Saracens, The Caliphs of Damascus, Bagdad, Africa, and Spain, The Modern Arabs, The Wahabees, The Bedouins &c. &c. London: T. Nelson And Sons, 1852. 8vo., xvi, 652 pp. With engraved frontis. illustrations, decorated half-title with circular engraved illustration plus 5 engraved plates with tissue guards all on thick stock. Folding map of Arabia. 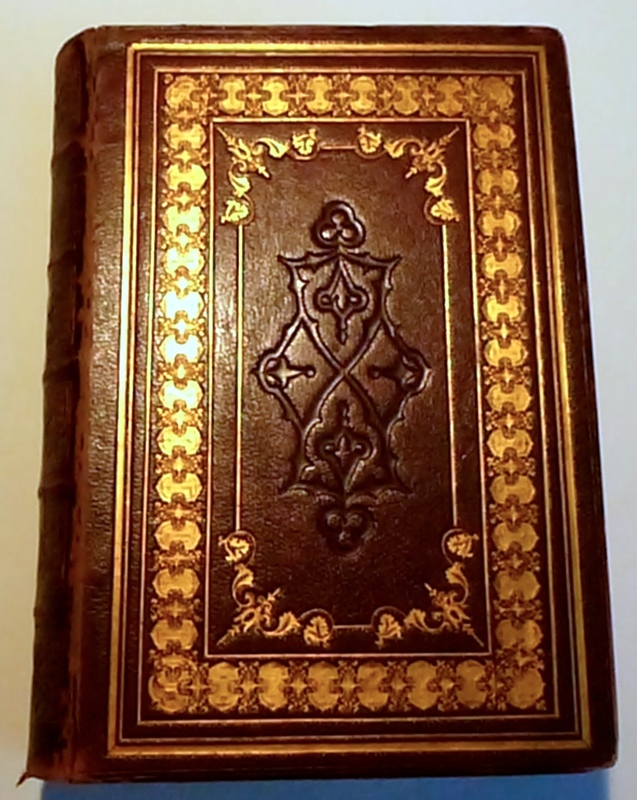 Contemporary dark brown fine-grained morocco with elaborate decorations stamped in gilt and blind on upper and lower boards, gilt-stamped decorations to 5 of 6 spine compartments with title in gilt on one. Edge and inner dentelles in gilt. All edges gilt. Pale yellow endpapers. Blue ribbon marker. Spine ends, bands, joints and panel edges moderately rubbed with wear to outer corners. Still bright with binding tight. Plates are uniformly age-toned with light fox spots. An attractively-bound copy. Andrew Crichton (1790-1855) Scottish biographer, writer and editor, wrote this historical and geographical account for the Edinburgh Cabinet library series. It was originally published in two volumes in 1833. New edition with revisions and additions. DOYLE, A. Conan. The Crime of the Congo. NY: Doubleday, Page and Company, 1909. 8vo., ix, (1), 128 pp. 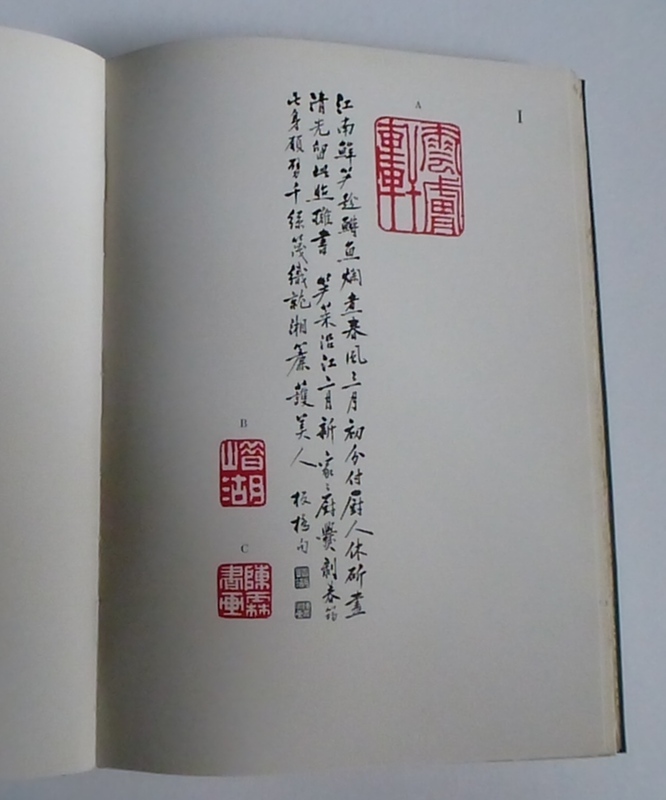 Grey-yellow cloth lettered in deep red on upper board and spine. Boards are moderately age-darkened around extremities and uniformly along spine. Lettering on spine is rubbed but still legible. Leaves lightly age-toned with a damp-stain mark to top foredge and outer corner of half-title leaf and in the same location on the introductory leaf vii-viii, extending ½ inch into the margin and not affecting text. Small paper label on front paste down “from the private library of Arthur A. Downing”, with his signature in block ink at head of title page. Binding tight. Still a very good or better copy. 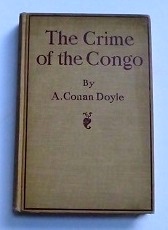 Outlines the famous author’s outrage at this conflict and “the crime which has been wrought in the Congo lands by King Leopold of Belgium and his followers”. A cutting indictment of those nations, in particular Britain and the United States, who have failed to respond. 1st U.S. edition. An uncommon book by this author. GANDHI, Mahatma. 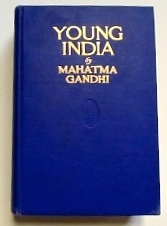 Young India 1919-1922. New York: B.W. Huebsch, 1924. 8vo., lxii, 1199 pp. including appendices and index. 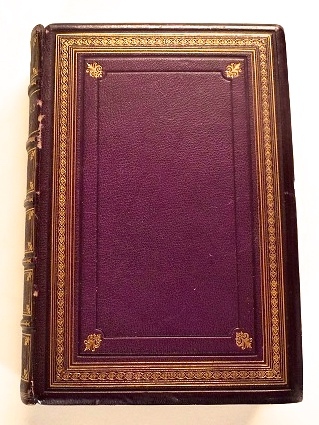 Publisher’s deep purplish blue cloth lettered in gilt with small blind-stamped oval device to upper board, gilt lettering spine. Top edge stained dark blue. Very light rub to spine ends and corners of boards. Light spotting to endpapers, foredges and lower edges. Otherwise a fine, bright, tight copy. Also includes “A Brief Sketch of the Non-Co-operation Movement”, by Babu Rajendra Prasad. LOW, A.P. Report on the Dominion Government Expedition to Hudson Bay and the Arctic Islands on Board the D.G.S. Neptune: 1903-1904. Ottawa: Government Printing Bureau, 1906. Tall 8vo., 9 1/16 inches, xvii, 355 pp. including appendices and index, plus photograph portrait frontis. and 51 unpaginated leaves of monochrome photos. interspersed. Chapter photo. vignette headpieces. Large colour-folded geological map of the Northeastern Part of the Dominion of Canada in back pocket to illustrate the report. 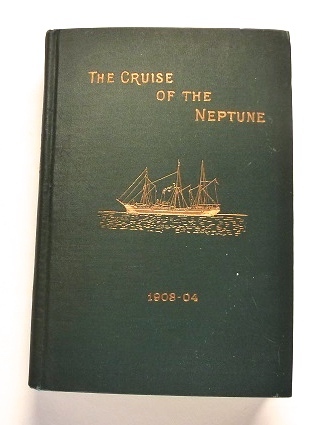 Original dark green cloth with the ‘Neptune’ stamped in gilt on centre of upper board. Gilt lettered on upper board and spine. Minor stains to endpapers and preliminary blanks, otherwise a near fine copy. The expedition, in charge of Low, was directed to patrol Canada’s Arctic waters and to establish Arctic outposts. The report includes much historical information as well as details on the Eskimo, geology, the whaling industry and Arctic navigation. This copy belonged to Robert Bell, Acting Director of the Geological Survey of Canada, and is SIGNED by him on the half-title page. Bell’s name is printed on the top margin of the folding map. (MANGIN, Arthur). The Desert World: From the French of Arthur Mangin. Edited and Enlarged by the Translation of “The Bird, by Michelet”. London: T. Nelson And Sons, 1869. 4to., xi, 624 pp. 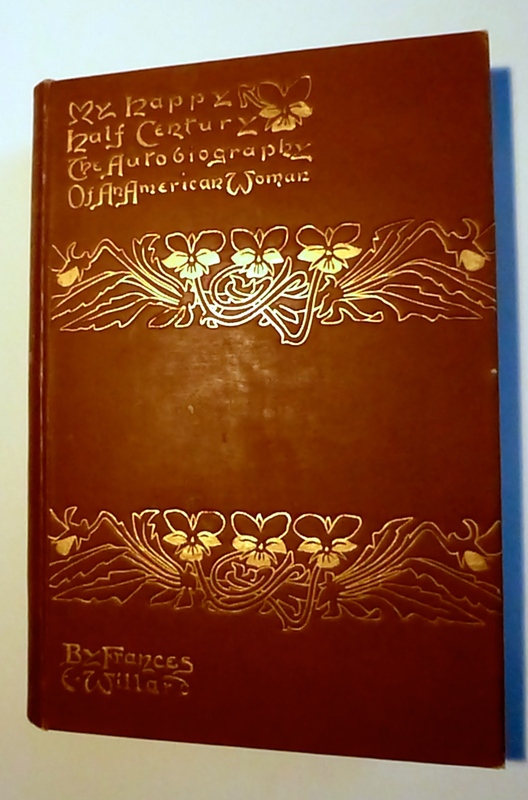 including whole page text engravings and vignettes by W. Freeman, Foulquier, and Van Dargent. Full dark purple fine-grained morocco over bevelled boards. Decorated in blind and gilt on both boards with gilt decorations in 5 of 6 spine compartments, lettered in compartment two. All edges gilt. Thick glazed pale yellow endpapers. Blue ribbon marker. Minor rub and wear to head and tail of spine, raised bands, and corners. Faint fox spots to half-title, title page, and last few leaves. Very light age-toning to leaves. An attractively bound copy, tight, clean. 1st edition in English. Enlarged. PINKERTON, Allan. The Spy of the Rebellion; Being a True History of the Spy System of the United States Army During the Late Rebellion. 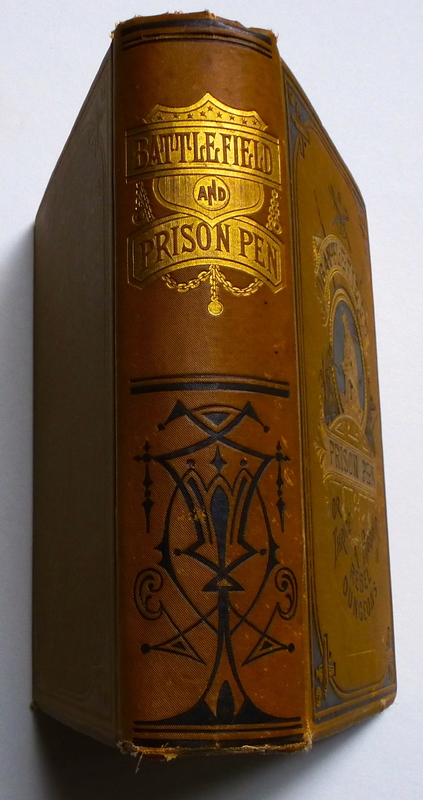 Revealing Many Secrets of the War Hitherto Not Made Public… Toronto: Rose Publishing Company, 1884. 8vo., xv, 336 pp. Frontis. plus 4 full page illustrations in text. Dark yellow-green cloth decorated in black on upper board and spine. Green-on-gilt and gilt lettering. Minor wear to head and tail of spine and outer corners. Leaves uniformly age-toned. Still a crisp, tight, desirable copy. Alan Pinkerton (1819-1884) renowned Scottish-born American detective and spy, is best known as founder of the Pinkerton National Detective Agency. During the American Civil War he served, in 1861-2, as head of the Union Intelligence Service, a much less sophisticated precursor to the U.S. Secret Service. Over the span of his illustrious and varied career, he produced many books, ostensibly based on his and his agent’s exploits. Many historians believe much was created by hired ghost writers although the books bear his name and no doubt reflect his views. 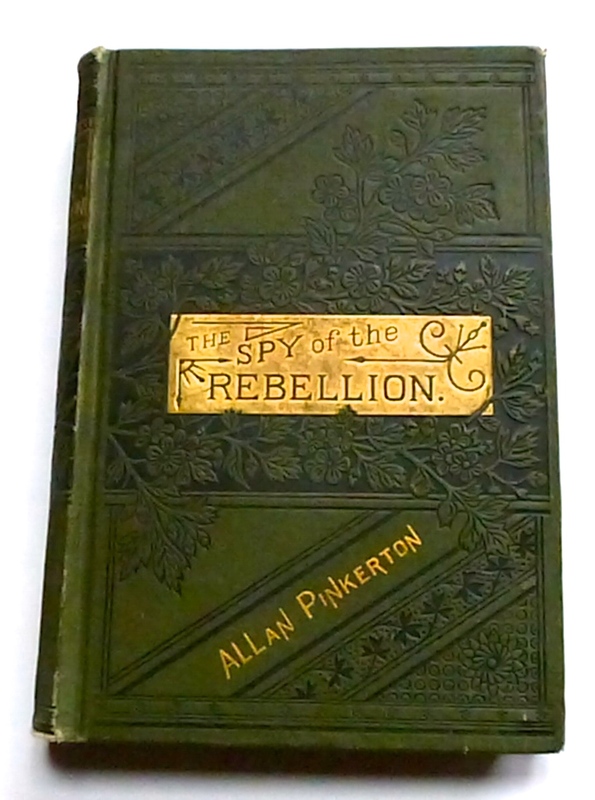 “The Spy of the Rebellion” is of particular interest because of its focus on his agency’s activities during the Civil War. P.I.X. (Theodore Douglas HALLAM). 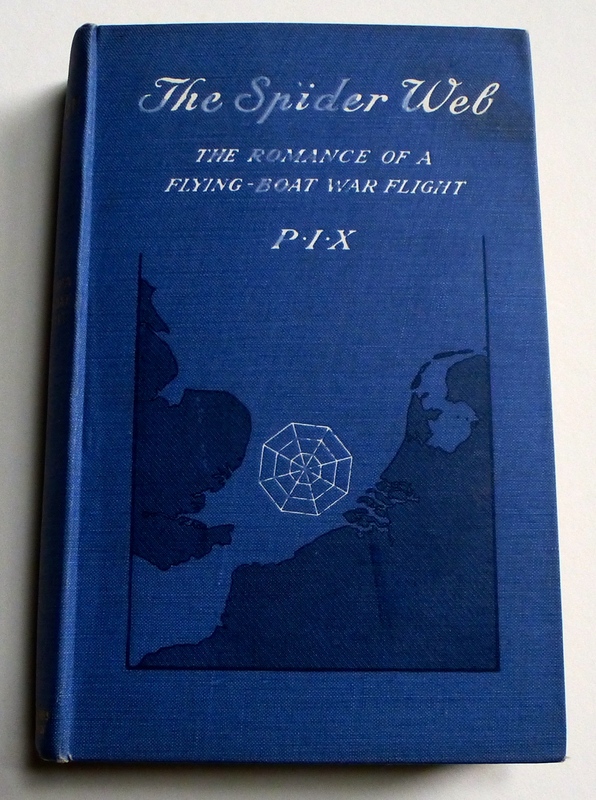 The Spider Web: The Romance of a Flying-Boat War Flight. Edinburgh: William Blackwood and Sons, 1919. 8vo., x, 278 pp. Frontis. portrait plus 19 monochrome plates of maps, photographs and diagram. Chapter head-piece vignettes. Blue cloth with map in dark blue and white spider web. 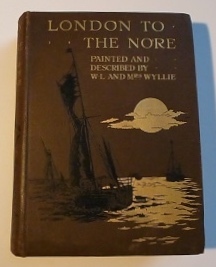 Upper cover lettered in white, spine gilt. Some rub and loss to white lettering on upper panel. Very light toning to leaf edges. Small, neat bookplate of original owner pasted to front endpaper. Otherwise a near fine copy. Hallam, a Canadian, learned how to fly at the Curtiss School in Hammondsport, New York, in 1914. After serving in a machine gun battery with the First Canadian Contingent, and in other theatres of war, he was posted to Felixstowe Air Station where he became C.O. of the War Flight in 1917. Here he recounts the little-known story of the flying boat war, largely against German U-boats in the North Sea, from March 1917 to the Armistice. ROBY, J. Traditions of Lancashire. London: Longman, Rees, Orme, Brown, And Green. 1831. Second Series. In 2 volumes. 8vo. Vol. 1: xxvii, 330 pp. engraved frontis., plus 4 engraved plates and engraved chapter head-pieces. Vol. 2: 340 pp. engraved frontis., plus 4 engraved plates and engraved chapter head-pieces. Bound in contemporary ¾ deep red morocco edged in gilt, 6 spine compartments, 2 with labels lettered in gilt. Fine-diaper-patterned cloth-covered boards in deep red. Top edge gilt. Marbled endpapers. Some rub and wear to leather spine ends, joints and corners. Very small tears to a few leaves due to careless opening. Plates lightly foxed around wide margins. Text clean and bright. An attractive, tightly-bound set with plates engraved by Edward Finden. SMITH, Justin H. The War With Mexico. New York: The Macmillan Company, 1919. In 2 volumes. 8vo., Vol. 1: xxii, 572 pp. including end notes and appendix. Vol. 2: xxiii, 620 pp. including end notes, appendix and general index to both volumes. Publisher’s dark blue diagonal fine-ribbed cloth stamped with blind horizontal bands on upper and lower boards, gilt lettering and matching bands to spine. Text maps and plans throughout both volumes. Very slight surface rub to spine ends, joints and corners. Lower corners slightly bent. Vol. 1: lower hinge cracked at endpapers professionally repaired and reinforced with Japanese tissue. Binding still firm. Vol. 2: upper hinge cracked 2 inches at head and ½ inch at tail with webbing showing but still firm. Very minor spotting to blank endpapers and foredges. Generally a solid, clean and desirable set. The war between Mexico and the United States in the mid-nineteenth century was soon eclipsed by succeeding wars of ever increasing scale. It was, nonetheless, a war of immense territorial significance, of national honour, of difficult operations to both sides and it also marked the beginning of the military careers of many who would go on to fight in the American Civil War. This meticulously researched and clearly written account by a professor of modern history won the Pulitzer Prize for history in 1920. 1st edition, published December, 1919. Scarce. SYNGE, J.M. The Aran Islands. Dublin: Maunsel and Company, 1907. 8vo., xii, 189, (1) pp, publisher’s list of books by Synge. Frontis. 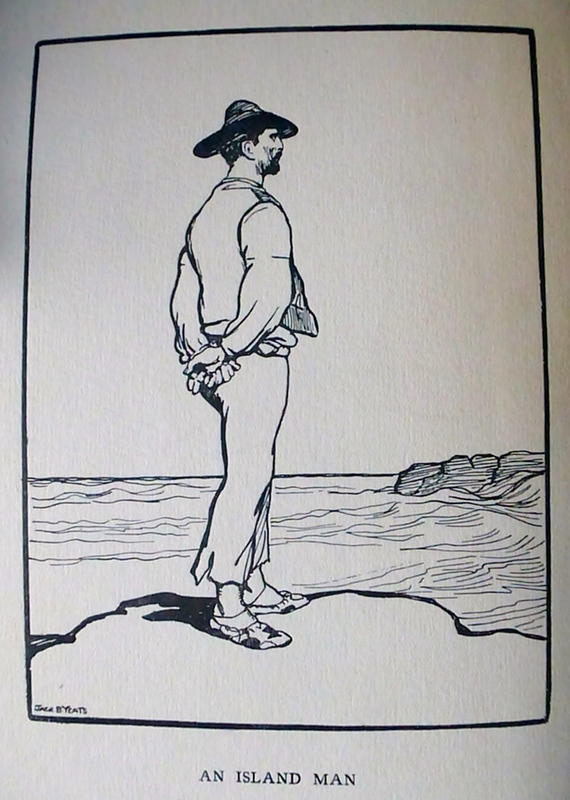 illustration with tissue guard plus 11 illustrated plates by Jack B. Yeats. Fine beaded blue cloth lettered in gilt. All edges uncut. Spine faded to brown, gilt still bright. Extremities and joints rubbed with moderate wear. Upper and lower free endpapers brown-stained. Neat pencilled signature of previous owner to front free endpaper. Some gatherings have parted slightly but all are still tightly stitched. Internally clean with wonderful captioned drawings by Yeats. John Millington Synge (1871-1909), Irish playwright, poet, prose and travel writer, was a key figure in the Irish literary revival and co-founder of the Abbey Theatre. With the encouragement of poet W.B. Yeats, he spent several summers in the Aran Islands where he collected stories and folklore from the locals. His experiences there were to form the basis for his later plays about Irish rural life. The author considered this book his “first serious piece of work”. Synge died early of Hodgkin’s disease, at that time untreatable. John “Jack” Butler Yeats (1871-1957), Irish artist and younger brother of W.B. was, in his early career, best known as an illustrator. He began to work regularly in oils only in 1906. 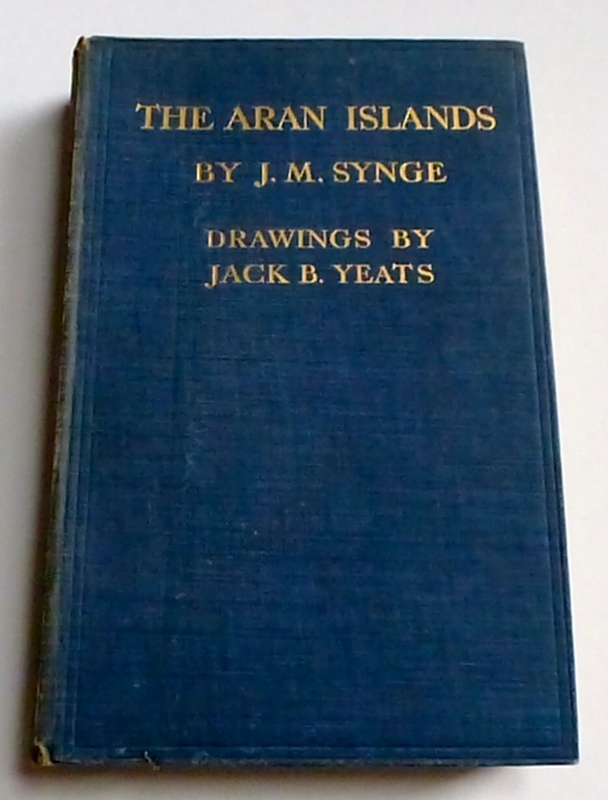 “The Aran Islands”, now regarded as a travel classic, was completed in 1901 but not published until 1907. 1st trade edition. Very scarce. 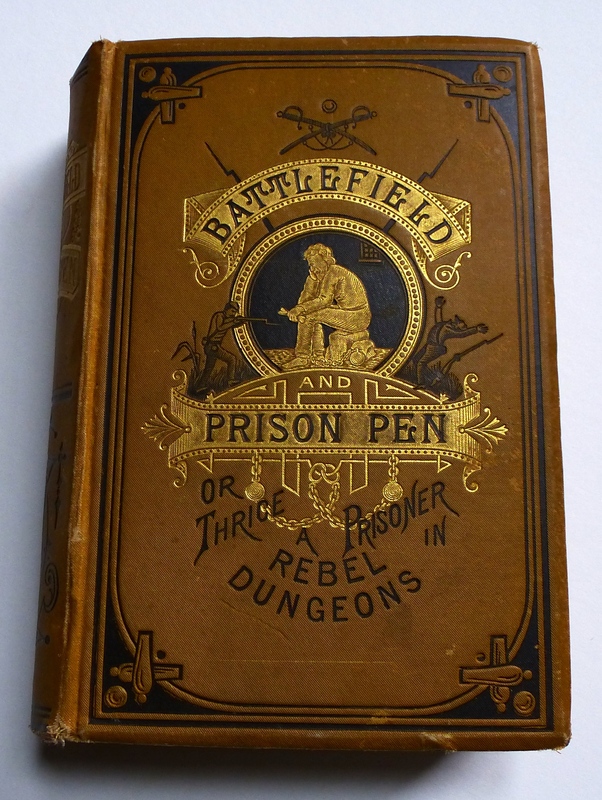 URBAN, John W. Battle Field And Prison Pen, or Through the War, and Thrice a Prisoner in Rebel Dungeons. Philadelphia: Hubbard Brothers, (1862). 8vo., xi, (1), (13) – 486, (4) pp. publisher’s testimonials. Dark yellow cloth over bevelled boards elaborately stamped and lettered in gilt and black on upper board and spine, lower board blind-stamped. Floral decorated endpapers in green and white. Engraved frontis. portrait with tissue guard plus 12 plates of engraved illustrations and battle plans. Light wear to spine ends and outer corners. Corners slightly bumped. Mild rub to upper joint. Light finger marks to blank prelims., with previous owner’s signature in pencil. Light fox spots to a few pages of text and last blanks. Two signatures appear to be pulled slightly out of alignment with the foredges but the sewing is tight as are the hinges. A generally tight, bright copy. The author served with Co. D, 1st Regiment Pennsylvania Reserve Infantry during the U.S. Civil War. He was captured at Malvern Hill, the Wilderness and Cold Harbor and was held at Libby Prison, Belle Island, the notorious Andersonville, Millen Prison and Florence, South Carolina, from where he emerged to recount his exploits of battles and harsh prison life. WHITE, William Charles. An Album of Chinese Bamboos: A Study of a Set of Ink-Bamboo Drawings A.D. 1785. Toronto: The University of Toronto Press, 1939. Tall 8vo., 11 3/8 inches, xv, 200 pp. including index and 12 sections of plates, seals and script. 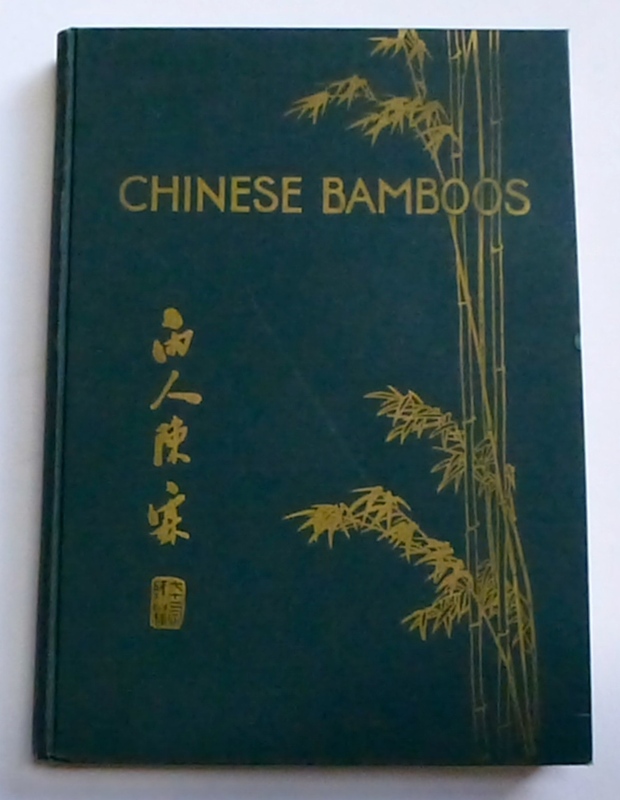 Publisher’s dark green cloth with bamboo design and lettering in gold to upper board, gold lettering to spine. Foredges uncut. Gilt-designed floral endpapers. Seals are shown in red and black. Very minor surface wear to spine with lettering slightly dulled. Otherwise a near fine copy of a scarce title. This is No. 2 in a series of archaeological studies produced by the Royal Ontario Museum (ROM). The study is a “literary and historical examination of a popular theme in Chinese art.” Charles William White (1873-1960) studied at Wycliffe College, Toronto and, after ordination, spent many decades in China as a missionary and, later, as Bishop of Honan. During this time, under the auspices of Charles T. Currelly, he collected many artifacts which became part of the newly-formed Asian collection at the ROM. He was an ardent sinologist and, on his return to Toronto, became associate professor of Chinese archaeology at the University of Toronto, and keeper of the East-Asiatic collection of the ROM. This copy is SIGNED, INSCRIBED and DATED, Feb. 1940, by the author to Mrs. Pelham Edgar, wife of Oscar Pelham Edgar, professor of English at Victoria College, University of Toronto. WILLARD, Frances E. My Happy Half-Century: The Autobiography of an American Woman. London: Ward, Lock and Bowden, 1895. 8vo., xvi, 392 pp. Frontis. portrait with tissue guard plus 6 monochrome plates. Medium yellow-brown cloth decorated and lettered in gilt on upper board and spine. All edges gilt. Yellow-brown patterned endpapers. Very light rub to head and tail of spine otherwise a near fine copy in an attractive publisher’s binding. Frances Willard (1839-1898) was an American educator, temperance reformer and women’s suffragist, influential in the passage of the 18th (Prohibition) and 19th (Women Suffrage) Amendments in the United States. Her vision embraced such topics as federal aid to education, free school lunches, unions for workers, the eight-hour work day, work relief for the poor among other issues. Her autobiography first appeared as “Glimpses of Fifty Years…”, published in Chicago in 1889. WREN, Percival Christopher (ed.) 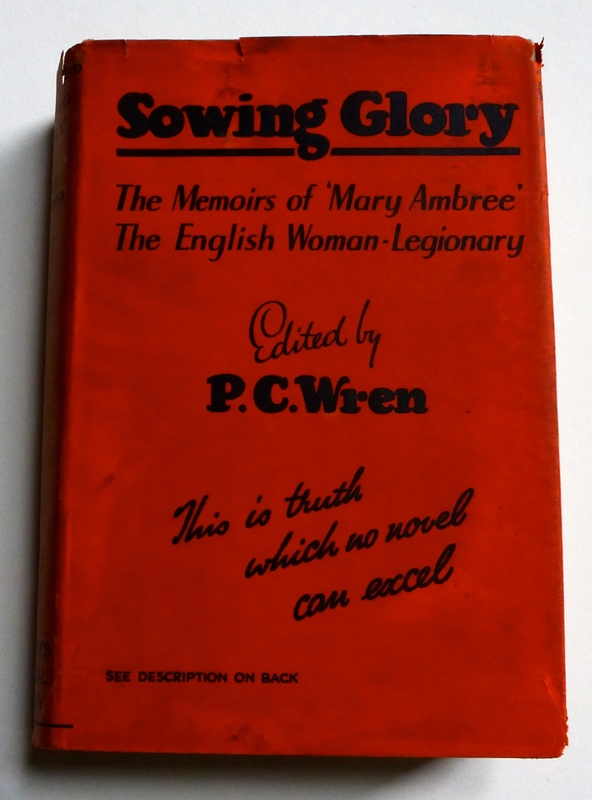 Sowing Glory: The Memoirs of “Mary Ambree” The English Woman: Legionary. London: John Murray, (1931). 8vo., 383, (4), 16 pp. Murray’s Imperial Library catalogue, dated January, 1931. Light grey cloth lettered in black. Original orange dust jacket printed in black. With a printed extract on publisher’s leaf from ‘The Daily Telegraph,’ 19th June, 1931 entitled “Woman in Foreign Legion”, loosely inserted. This was originally inserted in all U.K. editions. Five small red flecks to upper grey board and one tiny fleck to tail of spine, possibly from jacket (?). Jacket panels bright with slight fade to orange spine, a few grubby marks to surface, slight loss to outer corners, small tears to head of spine. Top edges lightly smudged. Internally clean. Binding tight. P.C. Wren (1875-1941) British writer mostly of adventure fiction, is best known for his novel “Beau Geste”, a much –filmed tale of the French Foreign Legion in North Africa. Sowing Glory is an edited memoir of a woman who used the pseudonym “Mary Ambree” (after the famous 16th century female participant in the liberation of the Belgian city of Ghent) in order to protect her identity. After having driven ambulances in France and Belgium during the Great War, “Mary Ambree” kept a diary while she served five years with the Legion in Morocco. Both the author and publisher verify the authenticity of her account retold here by Wren. WYLLIE, W.L. & M.A. London to the Nore. London: A. & C. Black, 1905. 8vo., ix, 260 including index, (4) pp. publisher’s list. Chapter head and tail-piece vignettes plus frontis. and 59 colour plate illustrations each with captioned tissue-guard. Publisher’s dark brown fine-beaded cloth illustrated in gilt and black on upper board and spine, lettered in gilt. Top edge gilt. Small fade patch to tale of spine extending into inner corner of lower board, probably caused by dampness. Outer corners spine ends mildly bumped and lightly scuffed. A few light spots to surface of lower board. Very light spots to foredges and endpapers. Two brown dampstain lines to title leaf; one across upper left corner, one across lower edge. Otherwise, boards are bright, leaves and plates are clean, binding is tight. William Lionel Wylie RA (1851-1931) was acknowledged as one of England’s foremost artists of maritime subjects at the turn of the century having spent his life along the coastal regions of England and northern France from where his observations of the sea and ships translated into evocative landscapes in oil, watercolour, etching and aquatint. The 60 brightly-coloured plates herein reflect that mood. The shop is closed for the winter. We continue to fill orders and answer email enquiries.